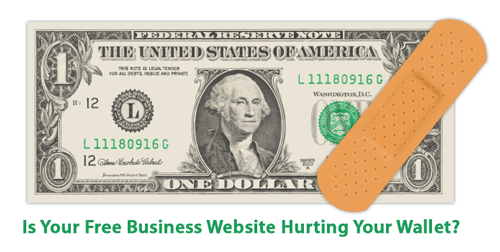 Is Your Free Website Maker Actually Cost You? Maybe you're a start-up or a growing business and a free website maker fits into your small budget right now. But have you thought about the fact that down the road that free website maker could actually cost you in another way. Whether it's years or months from now, you are paying a price in terms of your business image, credibility and maybe even your marketing strategy. Normally, free builders are free because in exchange for you using their services you allow them to either run advertising on your site and/or place a badge or link on your site. To a visitor, this kind of advertising can be intrusive or annoying. And the ads typically take away from the look and feel of your overall web design and brand. As more and more business owners are starting to use free website builders, the more likely it is that you are going to be using a template that's also being used by a thousand other businesses just like you. How can this hurt your business? If you are at that stage where you're trying to individualize your business by establishing a brand, you can't possibly do this with a widely used template design. It's not too bad for a start-up to use a template; yet, once you are a more established, growing business you are going to want to switch to a branded and original website. SEO (a.k.a. Search Engine Optimization) is very important for small business websites because it's through keyword searches that most of our websites are usually found. Most free websites tell you that you will be able to put in keywords but what they don't tell you is that you can only input sitewide keywords on the homepage or the same keywords on every page. What you really need is the capability to put different keywords on each individual page. How does a free website maker ultimately cost you? You are giving up quality - Your brand says everything about you and attracts the right kind of customers to you if done right. Yet, to the typical visitor, seeing a badge that says "This website was made free using..." is a dead give away that the business didn't want to invest a cent into their website. One could argue that they are holding on to their free website due to choice. But, you know what? Your visitor wouldn't know whether that's because of choice or because your business is doing so poorly that you had to get a free website. Do you want to chance someone making that assumption? Weakens your credibility – Well, it's not the fact that you want to save money that's the issue with free websites, but rather the fact that you wouldn't mind another business slapping their name over your polished look. Think about it... would you want to go to a financial advisor, doctor or any other professional that didn't want to invest in a website? Wouldn't you question why they couldn't afford or chose not to get a professional one? Definitely, consider these points if you are a business who hasn't established a business website, because you could be saving yourself from making a bad business decision. But, if you are one of the businesses who fits in the category of using a free website and decide to get one, keep these points in mind because at some point in time when these factors discussed start to effect you, you will know when it's time to move on.